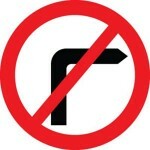 Turning right can be challenging for a learner driver due to hesitation and not being confident or fully understanding when they should wait or go. The driving test will of course involve many right turns on quiet residential or country roads, up to high speed national speed limit roads. Understanding the correct routine, rules for making right turns, the correct position and when to give way to oncoming traffic is essential. This tutorial explains this along with any right turn road signs that may be encountered. As with left turns, locating the right turn at the earliest opportunity will give you plenty of to prepare and take appropriate observations. 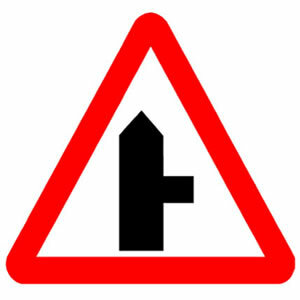 Check for right turn road signs, but some turns can be difficult to see. To help, look for gaps in houses, bushes/trees or parked cars that may indicate the right turn is ahead. There will be many right turns that you will be taking during the driving test. Each of these, you will be expected to use the MSPSL (Mirror, Signal, Position,Speed and Look) routine. Starting at the bottom of the diagram, we shall follow the correct rules for making a right turn during a driving test. Upon locating where the right turn ahead is, look into the interior mirror, followed by the right wing mirror. Signal to the right immediately after the mirrors. Position your car just to the left of the centre of the road. If there is a centre road marking, ensure you do not position your car on or over the line. Speed is dependent on whether you need to stop and give way to oncoming traffic and how clear (open or closed/blind) the right turn you wish to take is. If you do not need to give way and the right turn is open, usually taking the turn in 2nd gear at around 10-15 mph is sufficient. If the right turn is closed, and difficult to navigate, 1st gear at around 5 mph may be appropriate. You must look to determine if the right turn is open or closed and also to ensure the junction is free from cyclists and pedestrians before making the turn. If there are pedestrians or cyclists crossing, wait at the point of turn position before turning. Line the very front of your car up with the centre line of the road you intend on taking. The point of turn will eliminate making the turn too soon. Taking the right turn too soon will result in cutting the corner and driving on the wrong side of the new road. This will fail a driving test and is dangerous for oncoming vehicles coming out of the right turn. The point of turn will also eliminate the potential of taking the turn too late and possibly hitting the kerb or even mounting the pavement, both of which is likely to fail the driving test in this situation. If you need to give way to oncoming traffic, ensure you stop at the point of turn. 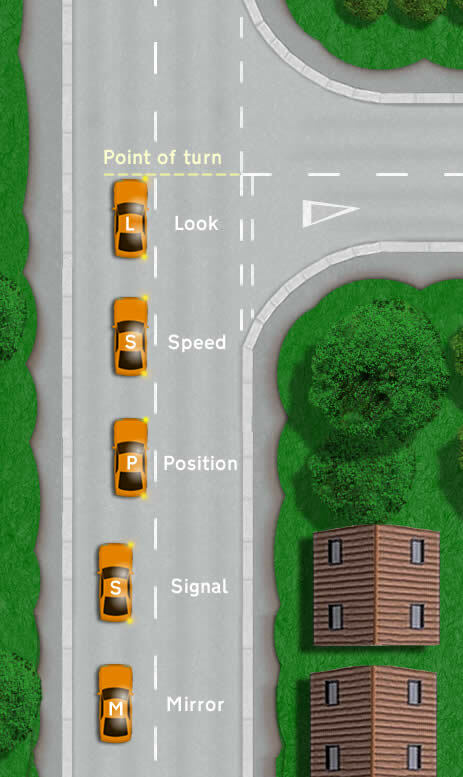 It can be difficult for a learner driver to know when to make the turn safely when confronted with oncoming traffic. As a guide, think of yourself as a pedestrian standing in the road exactly where you are sitting at the point of turn. When, as a pedestrian you feel it is safe to walk to the other side of the road to the right, would be a good indication that it is safe to make the turn in your car. This technique is only applicable to residential and city roads that have a speed limit of 30 mph. Turning right may of course involve giving way to oncoming traffic, but in many respects it can be easier than turning left. Your view of the road you intend to take is much clearer when making right turns and therefore spotting hazards is easier. Hazards to be aware of are pedestrians crossing the road at the junction lines and cyclists that can often be difficult to see. Also look out for narrow roads that may have cars parked close to the junction line as you may need to give way soon after you have made the right turn. Use the MSPSL routine on the driving test. Stop at the point if turn to eliminate driving on the wrong side of the road or hitting the kerb. Check for hazards such as pedestrians crossing the road, cyclists or parked cars before making the turn. Whilst driving, especially during a driving test, locating a right turn in plenty of time will provide you with more time to prepare. The examiner may possibly ask you to take the next available road on the right. Be careful as the next junction on the right may be no entry and will have a sign similar to the no right turn sign below. Obviously making a right turn in this situation is illegal and would fail any driving test. Examiner aren’t trying to trick you into making a mistake, they simply want to ensure you are taking notice of all road signs. You’re welcome. Hope it helps you to pass the driving test next time – and good luck! In this photo above, who should give way while turning, the red car or the orange car? It’s the cyclists lane that both cars need to cross, so they both need to give way to the cyclist. 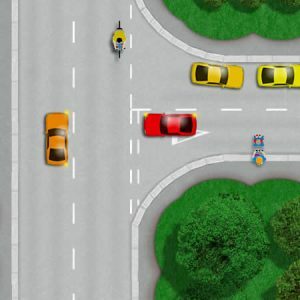 Once the cyclist has passed, the red car then must give way to the orange car. In respect of right turn, I have a query. In your tutorial, you have mentioned the point of turn as follows. the bonnet of the car is lined up with the centre of the road on the right side road. My instructor says for point of turn even if we line up the right side door mirror of the car with the centre of the road on the right side of the mirror it will be correct. It’s not an exact science, it’s a reference point to give learner drivers something to gauge with. Making the reference point further forward at the door mirror means you might have to turn a bit quicker, particularly into a narrow road so as not to overshoot the junction, whereas you don’t have that problem by making the reference point at the front of the bonnet. My turning on left and right was getting better from the minor road to major road but from major road to minor road, it is not improving. Every time I end up either turning more or less. I am not getting the proper judgment. Today from Major road to minor road right turn I have turned less and was about to hit the pavement and in one more right turn same from Major road to minor road I have turned more. Could you please advise me do I have to keep the rod width in mind. Can you please help me with this. My instructor is very strict and she shouts and then other simple things also I do wrong. Please advise. You need to do what I explained in the ‘turning left‘ page. The only way around this is to keep practicing, use reference points to help you and be persistent until you get the hang of it. There’s no easy fix I’m afraid. The only other thing I would recommend is to change instructor. An instructor that shouts is an instructor that is not training you properly. I have a specific query on the right turn. I have noticed in your right turn tutorial as we all on road we stop or slow down at 90-degree angle at right turn but in some right turn, we turn the steering wheel little bit on the right side (front wheel will be slightly turned on the right). Could you please advise why it is so? For positioning when turning right at a junction, you should keep the wheels straight when stopped at the point of turn. That way, you’ll know the car is straight and parallel. If you turn the wheel, you’ll risk the front of your car going over the centre line as you stop. With the point of turn being at the front of the car, there’s no need to ‘prepare’ for the turn. There’s plenty of time to make the turn provided you keep the car slow and turn the steering wheel reasonably quickly. The point of turn is simply a reference point as when turning right, stopping at the point of turn offers the driver a good view down the road they intend to enter and also a good turning point so that they don’t cut across junction lines. So you don’t have to stop at the point of turn, but be sure that you can always see that the road you intend on entering is clear from oncoming traffic and that you do not cut across any junction lines when making the turn. Always aim when making the turn to enter the new road into the left lane and avoid cutting across the right lane when turning – though very badly parked cars (right up to the junction line) may on occasions prevent this.